"I could not get my husband to eat pork loin or roasts. I tried dozens of recipes, but he would just say it was okay but would never want me to make it again. After numerous tries I came up with this, and he likes it, but only if the rub stays on it for 24 hours. Believe me he knows when it doesn't! Now it is a regular on the menu without complaint. I hope others like it." 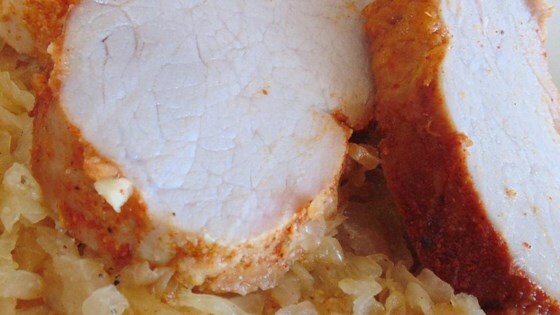 Rinse pork tenderloin with cold water, pat dry, and place in a baking dish. Whisk chili powder, garlic powder, and paprika together in a bowl. Rub mixture all over pork tenderloin until completely covered. Cover baking dish with aluminum foil and refrigerate for 24 hours. Brush a thin coat of sweet and sour sauce all over tenderloin and let rest for 10 minutes. Whisk honey and mustard together in a bowl. Brush a heavy coat of honey mustard onto the tenderloin. Pour water into the baking dish to reach a depth of 1/2-inch. Cover the baking dish with aluminum foil. Cook until pork is slightly pink in the center, about 1 1/2 hours. An instant-read thermometer inserted into the center should read at least 145 degrees F (63 degrees C). I like to rub the pork on Saturday and baste on Sunday morning. I then put the pork in the oven on 250 degrees F (120 degrees C) for 3 hours then set to go to warm. That way it is ready when I come home from church. While it is on warm I baste again and prepare my side dishes. You can apply rub for a shorter time and then apply baste but you won't get the flavor into the meat, it will only be on the outside of it. I made it for our community's potluck and was an instant hit! I received several requests for the recipe and asked to make it again. This is now a permanent recipe in my book.